They're holding hands on the subway station, trying to figure out what we all need to do to get back home. Do we take the D or the F? At that point, I'm just going to follow them. I'm too deep in thought to figure it out after having left a meeting about ongoing protests and what we, as community organizers who support and love each other, can do to support and love the teenagers leading in the streets. I watch as my friend holds her hand and I wonder, will he become the next target? What will the cop say about this young boy, younger than me? I cringe. And shake those thoughts from my head. Then I look at both of them again and begin to grasp the depth and the importance of this moment, of this movement. Ever since the shooting death of Michael Brown, the conversation on racial issues in this country has been non-stop. This was spiked when a grand jury of only three black people out of twelve made the decision to let Darren Wilson go without an indictment. Since then, the reaction from the black community has really been incredibly fierce. Protests and actions have taken place across the country, and there seems to be no end in sight. Just as I begin typing this, demonstrators are staging a die-in at the Barclays Center where the British royal couple, Prince William and Kate, are viewing a basketball game; the theme of this action is #royalshutdown. At that same game, Jay-Z and Beyoncé are to greet the British couple. At that same game, team players are sporting "I Can't Breathe" t-shirts. (Disclaimer: I could care less that Jay-Z gave them those t-shirts). As a result of these amazing actions, the conversation is everywhere. Ferguson is everywhere. I hear the conversation in community spaces where it wasn't before, and I hear it in my workplace. I see people feeling compelled to take sides rather than just brush it off. And though it has been cathartic to have such a relevant conversation become mainstream, it is also showing just how ugly America really is. Facebook has become a non-safe space that is polarized between those who stand with Ferguson and those who many of us didn't realize were racist (! ), the #BlackLivesMatter hashtag was counteracted with the #AllLivesMatter hashtag, and people are even using images of Martin Luther King Jr. to condemn alleged looters although he did say that "a riot is the language of the unheard" (also...MLK was shot). And let's absolutely not forget the hate crimes and the lives that have been lost since these protests began (Rest In Power DeAndre Joshua) . For many of us, this experience has been traumatizing, and overall emotionally draining. The "blood memory" and inter-generational suffering of our ancestors is burning with the new flames of this movement. And we can feel it. I felt it today while talking with co-workers about young men of color and suddenly feeling like I couldn't hold my tears. I felt it when I looked at my friends holding hands on the subway station and I understood that although both of their individual stories will be forgotten, the movement as a whole will be remembered just as we try to honor our ancestor's resistance against colonizers. It almost feels as if this had already happened, and in reality it has. When Rosa Parks was arrested for refusing to give up her seat, she wasn't yet aware that it would result in the Montgomery Bus Boycott. Although she was an activist in the community, on that night she claims that not giving up her seat wasn't an orchestrated event, she instead claims that she was actually "tired of giving in". "I didn't have any idea just what my actions would bring about. At the time I was arrested I didn't know how the community would react. I was glad that they did take the action that they did by staying off the bus"-Parks' response when asked if she thought her actions would have such far reaching effect. Rosa Parks, like many others who didn't give up their seats including the less-known Claudette Colvin, are not the movements themselves, but rather crucial pieces that formed the Civil Rights Movement as a whole. And in this very moment, all of us are part of this lucha that is essentially bigger than us as individuals and as people living in this particular moment in history. The decision to not indict officer Darren Wilson in the shooting death of Michael Brown was announced on the same week as this year's Black Friday. Consequently, a campaign was launched to #BoycottBlackFriday. Sales went down by 11%. The correlation between this decrease in shoppers and the campaign to boycott Black Friday is clear; One certainly must have happened as a direct result of the other, especially after knowing that unemployment rates have decreased. Furthermore, an African American Shopper Analysis shows that "African Americans are more likely to be deal seekers than average." Still, The New York Times [mis]attributed the low shopping numbers to a loss of interest on the part of consumers rather than to the boycott itself. This lack of publicity almost serves as a way to discredit the boy-cotters. And yet that drop in sales is a reminder that African Americans have power, especially when being strategic about how to use it. The African American community is showing that a difference can be made when acting in numbers. This is not only visible in the drop on Black Friday sales, but also when out there chanting on the streets, together, in solidarity. One thing that has been amazing to me has been witnessing the strength in our youth today. High Schoolers have been walking out, and folks that I've been seeing in protests are chanting "We're young, we're strong, we can do this all night long!" Many believe that the number of protesters is going to be difficult to maintain, especially with winter and Holiday season well on its way. Yet at this very moment in time, we know that the anger levels are high and so is the energy. Last year during this season, I participated in an action at the Rockefeller Center where we sought to bring attention to the prisoners living in torturous conditions in Guantanamo Bay. This particular group planned actions every month despite the small response that we were receiving. I felt disheartened at times until a friend said that he does this so that when the history of this particular struggle of closing Guantanamo Bay is written, the future generations will know that we were there protesting. 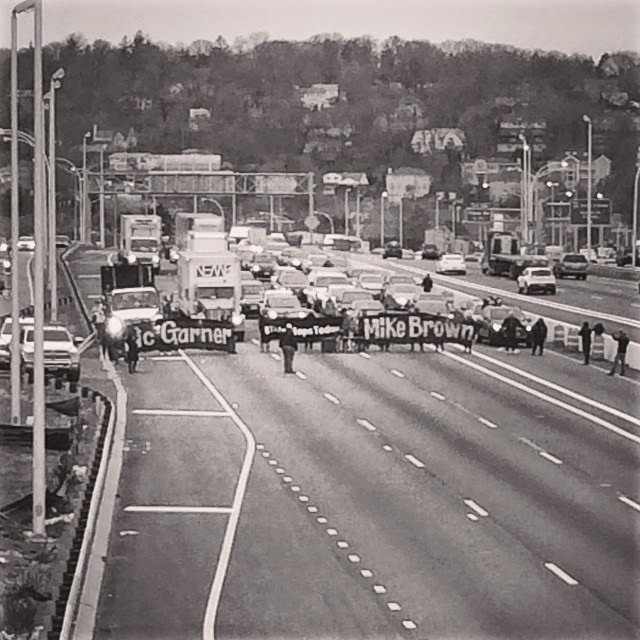 So whether it's dozens shutting down the Staten Island Expressway, or thousands shutting down three New York Bridges, all resistance is important. 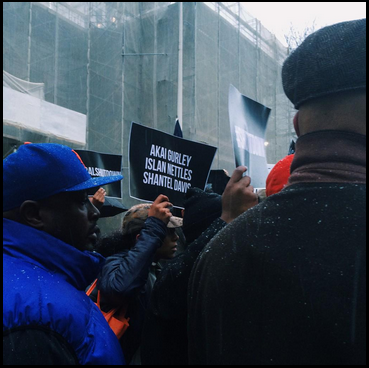 At least 76 unarmed men and women of color have been killed by police since the murder of Amadou Diallo in 1999. At least 3 more cases of shootings and deaths by cops of unarmed black men, and boys, have occurred in the past four weeks. At least 7 minutes passed while Eric Garner's body was left on the floor after officer Daniel Pantaleo choked him. And only one indictment was made in Eric Garner's case, and that was for Ramsey Orta, the man who filmed the moment when Garner was killed. So we must stay present in the streets, in organizing meetings, in educational spaces that we can either create or join in order to fight these blatant injustices. We must stay present in this movement. We must keep fighting for this moment to remain important and to create radical change. As people of color who were brought to this side of the world through slave trade - as people of color who have been through generations of genocide, we were never even meant to survive. Hence our survival is already a symbol of resistance, and our lives are incredibly valuable. Let's make them count even more. Great read, perfect post protest reflection! 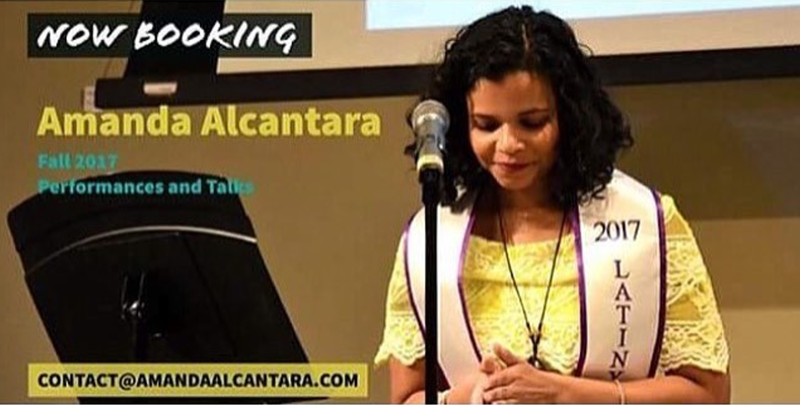 Thank you for sharing hermana!